With the Mets out there determined to sweep the Marlins before heading up to New York for the team’s home opener. New York sent Jacob deGrom to the mound while the Marlins sent out sophomore pitcher Trevor Richards. After Keon Broxton got a one out opposite field single, Amed Rosario would also go opposite field with an RBI triple in the gap. deGrom out of all players would set the tone in the third inning by leading off with a home run, Nimmo then would draw a walk before Alonso hit his fourth double while driving in his seventh run of the season. Michael Conforto cranked the Mets fifth hit of the evening down the right field line for a double, four out of five of the Mets hits at this point have come for extra bases. Richards then struck out Alonso and Conforto, before getting Tomas Nido to fly out to right field. After Alonso scorched a two-out single in the seventh, Robinson Canó followed with an opposite field RBI double, putting the Mets up by four. J.D. Davis would reach after an error by newly entered Miguel Rojas and a softly tapped grounder to the pitcher. Dom Smith then hit a grounder that took a hop and the edge of the infield causing the ball to go way over Castro’s head for a single. “The Buffalo” Wilson Ramos came into to pinch hit for Jacob deGrom and hit a line drive opposite field RBI single, with Dom Smith coming in to make it 6-0.
deGrom would end up going seven innings, giving up two hits, while walking one and a career high 14 strikeouts against the fish. deGrom threw 114 pitches however, he didn’t really seem to labor at any point of the evening. 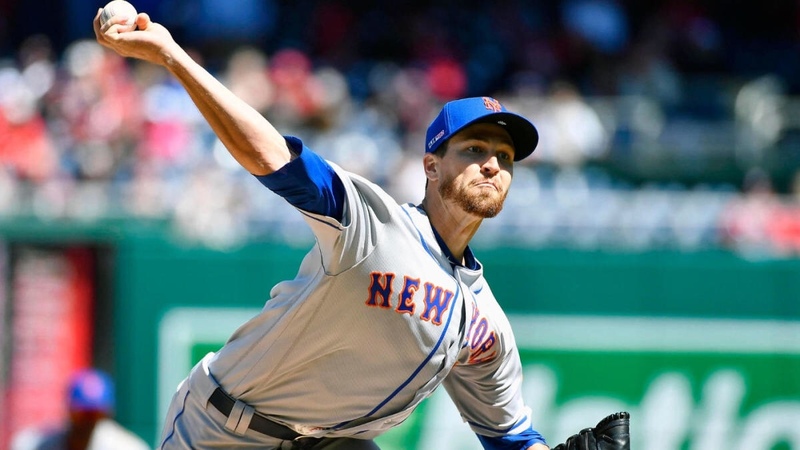 Jacob deGrom has now pitched in a Major League record tying 26 straight quality starts and has gone 26 scoreless innings, with 40 strikeouts, and just 2 walks dating back to last season. Mets lefty Luis Avilan would come in to pitch a scoreless eighth, however, he got into trouble in the ninth when Starling Castro drove in a run causing Mickey Callaway to go to Robert Gsellman with for the second straight game. Gsellman entered with runners on second and third with no outs, he first got the speedy Brinson to ground out to third, bringing in the second run for the Marlins. Then catcher Jorge Alfaro then whiffed at a nasty slider for the second out but Herrera drove an RBI double to left, Miguel Rojas followed with a hard hit single to cut the lead to 6-4. Callaway would opt to go to closer Edwin Diaz to finish the game off, and that’s exactly what he would do as he got former Mets outfielder Curtis Granderson to fly out to left field to secure his third save of the season and Jacob’s second win. The Mets are now 5-1 to start off the season and will take on the Nationals tomorrow afternoon. The Mets will send Noah Syndergaard to the mound to take on the Nationals and Stephen Strasburg, the two pitchers will face each other for the second time of the season.